One of few remaining perfume houses still drawing deeply upon the tradition of exquisite natural perfumery, Goutal presents an impressive collection of seven classic gentlemen's fragrances where understated quality is the unspoken (but very much demanded) expectation. From the original zesty Eau de Monsieur (now in its fortieth year, much copied but still unsurpassed), to their latest woody cologne Bois d'Hadrien, putting together one's wardrobe where refinement and enduring classic styling is key, is now a Riviera breeze. Goutal has always taken us on a journey, and no matter where we are, from the boardrooms of London to the cafe bars of New York, the fragrant wild herbs from the foothills of Provence or the citrus groves of Tuscany can always be with us. Goutal isn't obvious, flash or vulgar. It is refined classic tailoring in a bottle, where quality of materials speak in an understated but confident voice. Equally at ease with formal or casual wear, the style is light, fresh and nuanced. The ultimate in French chic on a man. There are 7 products in the range for you to explore: you are viewing page 1 of 2. 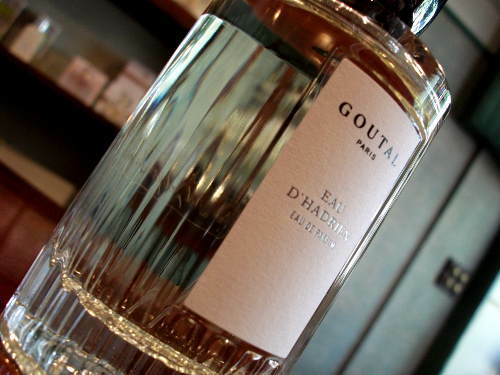 Inspired by the story about the Emperor Hadrien, this is one of the earliest Goutal creations. A strong and quietly confident personality. A souvenir of those holidays in the south of France when time stood still and the days never ended. The freshness of citrus under the cool shadows of the trees. Goutal's latest woody cologne for men, with the scent of citrus orchards in a Tuscan summer. It's a picture of languid ease where Bois d’Hadrien returns to the timeless summers when Goutal's colognes began, with the sparkle of lime amid the wooded lime groves of Italy. A subtle citrus chypre in the classic style. Soft notes of neroli and mint over a base of moss, sandalwood and patchouli. Refined and retrained with more than a dash of distinctiveness. May we recommend the 'Windsor Knot' (also called the 'Double Windsor')? Silk obviously, and although finding good quality silk ties these days can be tediously unrewarding, the final result of a stylish, size-balanced, symetrical knot is a classic look that will never date. Wear with a semi-cutaway collar and, naturellement, your favourite Goutal cologne.